Drain maraschino cherries, and return to jar. Pour brandy, if desired, in jar; cover with a lid, and freeze 8 hours. Drain cherries, and pat dry, reserving brandy for another use. Melt 6 ounces of the chocolate in a saucepan over medium heat, stirring until a candy thermometer reaches 115°F/46°C. Remove from heat; add remaining 2 ounces of chocolate, and stir until candy thermometer reaches 89°F/31°C and chocolate is smooth. 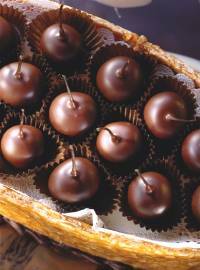 Dip cherries quickly into melted chocolate, coating well. Place cherries on wax paper, stem sides up, and cool. Makes 2 1/2 dozen cherry cordials. YUMMY!! i used dairy milk chocolate (cadbury) in it, turned out superb! thanks. i never used the thermometer but the chocolate was fine.